Are you using TARGETS effectively to increase sales? What happens if you don’t have targets? In business, it’s easy to be pulled in different directions and go ‘off track’. With so many distractions we are often enticed away from what is really important and requiring most focus to achieve growth (especially away from sales activity) and waste time on fruitless activity. Does this sound familiar to you? Or are you seeing this in your team? As business owners, we only have a finite amount of (precious) resources – time, energy, attention and money – available to us. Wasting any of these can make or break your business. How many times have you noticed that you have more tasks left on your to do list than you anticipated? And how many times have you been frustrated by the fact that you seem to have got no further on something even though a whole day has gone by. Targets help us to define the activities in our business and make the most of our resources. They create clarity. They ensure focus in sales enabling us to build the business. They provide direction and give the best chance of best performance whether that be individual, team or business performance. Ultimately they increase the chance of achieving the business growth ambition aim. You may have heard the phrase “where you look is where you go”. 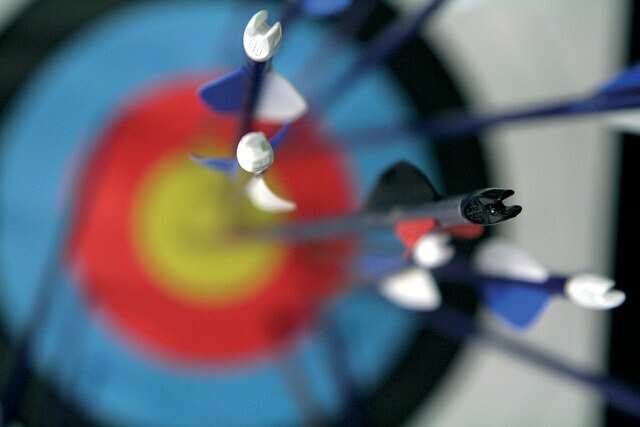 The key to setting great targets is to understand the nature of your target setting or measurement in the business and the reasons for doing it. An effective target or measurement is one that adheres to these 4 key criteria – it is context driven, it is helpful to those who use it, drives the business forward and it is simple to understand and use by those relevant. Sometimes it is more effective to set targets for the activity that leads to sales, rather than only setting a specific financial target. If you know in your business that 17 sales calls produces an average of £20,000, then it would be worth setting the target for the calls, not the sales. A target of increasing your ‘list’ or database by 40 people weekly may be understood by the management team, but only if those who are responsible for growing the number of new contacts understand that this increase is then linked on average to 4 new pieces of business. What is driving your sales results? What targets can you set to ensure the right activity is being done and give your business the best chance of increasing your sales?